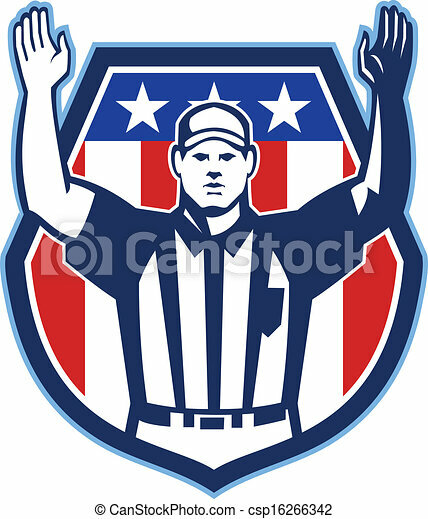 Illustration of an american football official referee with hand pointing up for a touchdown facing front set inside crest shield with stars and stripes flag done in retro style. 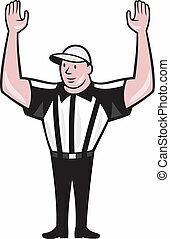 A cartoon football referee with his hands up signaling touchdown. 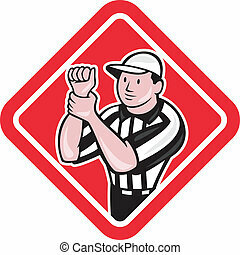 American football sideline markers icon. Vector illustration. 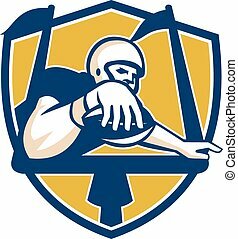 American football sideline markers icon. Flat color design. Vector illustration. 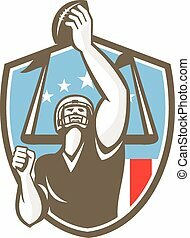 American football sideline markers icon. Blue frame design. Vector illustration. 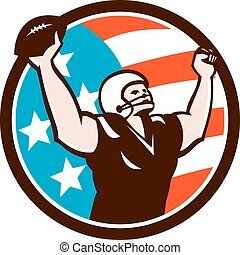 American football sideline markers icon. Thin circle design. Vector illustration. American football sideline markers icon. Shadow reflection design. Vector illustration. 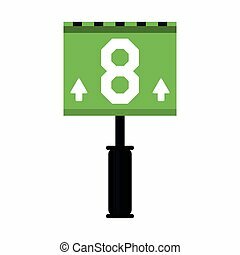 American football sideline markers icon. Glossy button design. Vector illustration. 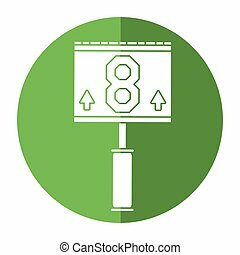 American football sideline markers icon. Orange background with black. Vector illustration. American football sideline markers icon. Gray background with green. Vector illustration. 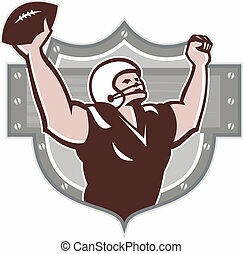 American football sideline markers icon. White background with shadow design. Vector illustration. 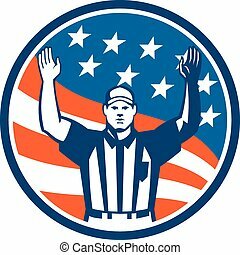 Illustration of an american football official referee with hands up for a touchdown facing front set inside circle with stars and stripes flag in the background done in retro style. 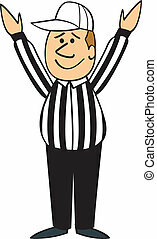 Illustration of an american football official referee with hand pointing up signal for a touchdown facing front set on isolated background done in cartoon style. 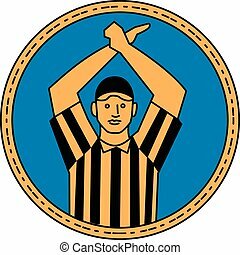 Illustration of an american football official referee with hand signal signalling illegal use of hands facing front set inside diamond shape done in cartoon style. 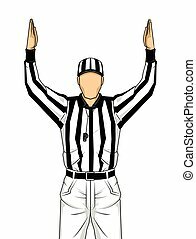 Illustration of an american football official referee with hand signalling illegal use of hands facing front on isolated background done in cartoon style. Illustration of an american football with helmet holding ball over head celebrating touchdown viewed from the front set inside circle on isolated background done in retro style. 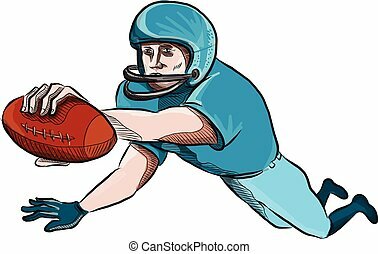 Illustration of an american football gridiron player receiver with ball scoring touchdown under the goal post set inside shield crest done in retro style. 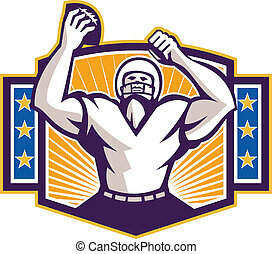 Illustration of an american football gridiron wide receiver running back player celebrating a touchdown facing front set inside shield crest with stars and sunburst done in retro style on isolated background. 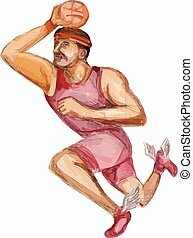 Icon retro style illustration of a British American football referee,head linesman, down judge or line judge calling touchdown with United Kingdom UK, Great Britain Union Jack flag set inside circle. 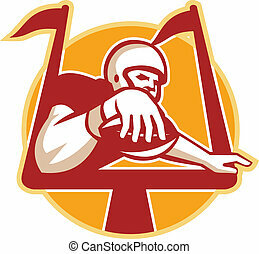 Icon retro style illustration of a Canadian football referee,head linesman, down judge or line judge calling a touchdown with Canada maple leaf flag set inside circle on isolated background.